When do I need a separate Image Processing Client? The Image Processing Client is an auxiliary client that helps the Automated Input Client to speed up documents input processing. This is only a concern if you need to input thousands of documents per hour from one source, such as a watched folder or an email account. It is installed the same way as the other automated clients and only communicates with the server. The image processing client does not have its own role and must be configured from the Input client watched folder settings. 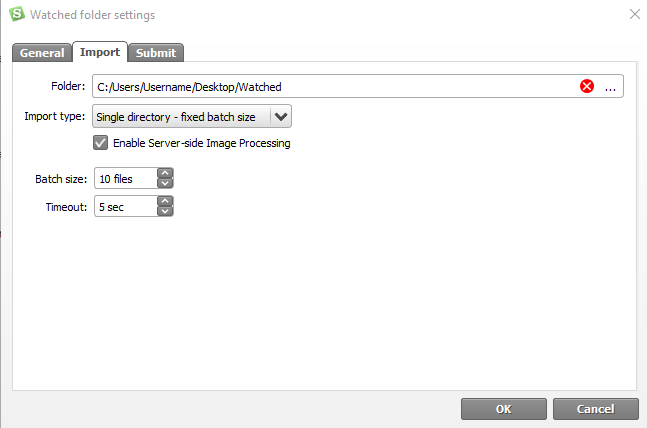 Open the Settings for a selected watched folder, go to Import and check Enable Server-side Image processing. If you select this checkbox but don’t have an Image Processing client installed the batches will get stuck, waiting for an Image Processing client. © Copyright 2018, SmartSoft Ltd..